On An Overgrown Path: How can you consider that music? How can you consider that music? 'The importing agent in Den Pasar handled among other things, Oriental records, Chinese, Malayan, and even recordings from the Koran. There were shelves of Balinese recordings - sacred texts, cremation music, theatre, music from the shadow-play. They had been made in Bali in the late 'twenties by two German firms, Odéon and Beka (label below), and were rare, since only a few had been considered successful enough for the European market. You could not get them in Europe, or even Java, but here they had been stored in quantities. They had been made, of course, to sell on the island - a naïve project, for no Balinese had money or even the desire for a phonograph. Why should they sit and listen to disks when the island rang day and night with music? Thus, one morning, when I bought two sets, the agent remarked bitterly that this was the first sale in a year. I shall throw them all out, he said angrily. They are only taking up room on my shelves. It was a warm day, and I thought that he was perhaps infuriated by the heat as much as anything else. But, later, when I knew I was leaving, I returned for another set of records, only to find that he had, in one of those quick fits of rage that can seize a Westerner in the tropics, smashed them all the week before. Not one remained. Good riddance, he exclaimed defiantly. He seemed quite pleased at my dismay. Anyway, he suddenly shouted, how can you consider that music? You, who call yourself a musician? He looked at me through his thick glasses with sudden hatred'. Colin McPhee writes in A House in Bali of the destruction of the remaining stocks of the historic gamelan records that were to have such an influence on Western composers including Benjamin Britten and Lou Harrison. More on Colin McPhee here. Buy MP3 downloads of the historic gamelan recordings here. 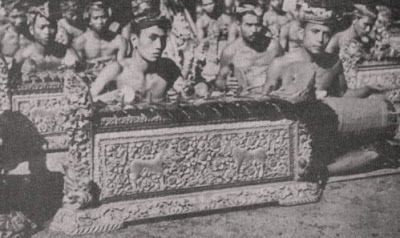 Photo of G'ndérs playing the melody for the lélong dance from A House in Bali by Colin McPhee, Oxford University Press ISBN 0195804481, out of print. 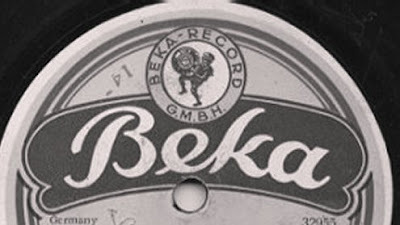 Beka record label from Wikipedia. Hear Colin McPhee's gamelan inspired Tabu-Tabuhan on my Future Radio programme on Sunday December 9 at 5.00pm UK time (convert to local time zones here) I will also be playing Lou Harrison's 1985 Piano Concerto. Listen by launching the Radeo internet player from the right side-bar, or via the audio stream, on Sunday December 9 at 5.00pm UK time. Convert time to your local time zone using this link. Windows Media Player doesn't like the audio stream very much and takes ages to buffer. WinAmp or iTunes handle it best. Unfortunately the royalty license doesn't permit on-demand replay, so you have to listen in real time. If you are in the Norwich, UK area tune to 96.9FM. Any copyrighted material on these pages is included as "fair use", for the purpose of study, review or critical analysis only, and will be removed at the request of copyright owner(s). Report broken links, missing images and errors to - overgrownpath at hotmail dot co dot uk. This seems an appropriate place to mention that McPhee was not working in a vacuum. The American composer Henry Eichheim (1870-1942) went there and did that well before Colin, garnering performances by all the important American orchestras of his large works incorporating indigenous music and instruments he brought back from his many travels. Stokowoski (who traveled with Eichheim) was an ardent advocate of Eichheim's, which may explain why he was not too involved with McPhee. Thanks for that John, although Colin McPhee didn't seem to think Henry Eichheim had been there and done exactly that. Carol J. Oja's book on McPhee quotes a letter by him to Henry Cowell in spring 1935 in which McPhee says he expected "to have a couple of orchestral work(s) finished by fall - a prelude and toccata (sic), and a 'fantasia' for piano and orchestra on Balinese melodies and rhythms - authentic stuff and not dished-up impressionism à la Eichheim." (Henry Eichheim's orchestral works Java and Bali had been written in 1929 and 1933 respectively). One of my most fascinating musical experiences was playing in a gamelan orchestra at Dartington when I was a student. After you've entered and become part of that soundworld with all its ringing overtones for two hours at a stretch, a Mozart violin sonata can seem very strange indeed. Pliable, thanks for that highly interesting quote from McPhee. My having examined the scores to Eichheim I have to doubt the intimacy of McPhee's acquaintance with them, for while Eichheim's basic style does show a general french influence, it is hardly "dished-up impressionism". Eichheim deeply incorporates the ethnic melismas, instruments and rhythms in each of his works to a degree which which I think equals McPhee's. The one work of Eichheim's which may be a bit softened around the edges is his suite for small orchestra Oriental Impressions. One day I hope everyone can hear all this music. It can only add to the depth of American music and serve to yet again disprove the theories of linearity that attempt to prove some inexorable stylistic progression toward a generalized avant-garde. Eichheim, McPhee and Harrison prove that their pursuits were no mere byway.